Please read this article to learn how to perform Password Resets for Telstra Marketplace users. 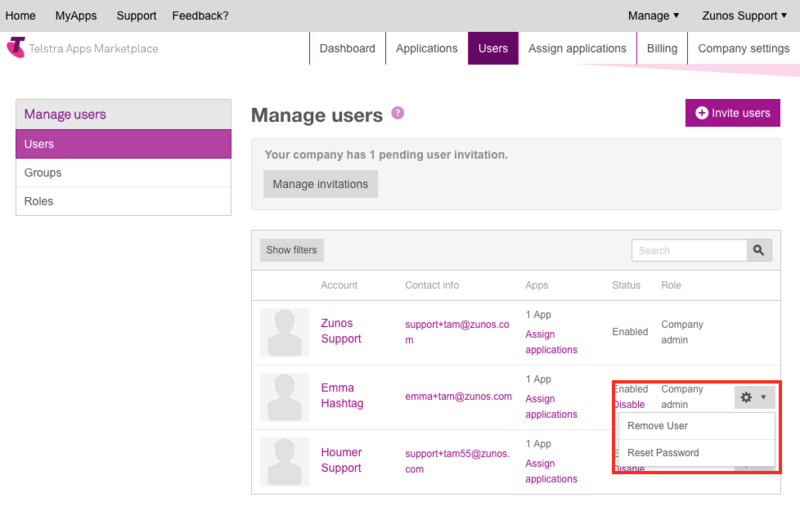 The Telstra apps marketplace makes it easy to manage your mobile users across multiple platforms such as Zunos. Simply login to your Telstra apps marketplace account using the details provided by your Telstra account manager and follow the steps below. Click on the Manage Tab at the top right hand side of the marketplace menu bar. A drop down menu will appear, click on the Account option from the list. Find the user who needs their password reset. Click the cog to the right of their name. You will be presented with a drop down list, select Reset Password.